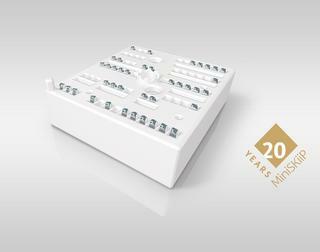 MiniSKiiP – Anticipating the future for 20 years. Today - The power density master for motor drives. 20 years ago the MiniSKiiP was born. A unique design, setting a new standard in the power electronics world: solder-free PCB assembly using spring contacts, leading to the shortest of assembly times, easy PCB design and a high degree of connection reliability, resulting in an immediate system cost benefit. With more than 35 million modules in the field, MiniSKiiP has changed the world of power electronics. It is the first module available with pre-applied Thermal Interface Material, one of the first industrial standard modules with Silicon Carbide and is the only module to cover a power range from 1 to 90kW as a full motor drives solution. Today, we are still innovating the future. Utilizing the SEMIKRON technology portfolio, MiniSKiiP boosts reliability and power density and is now finding its way into new markets such as medium-voltage inverters. In the area of motor drives, MiniSKiiP has become the Power Density Master. One way to achieve this is to optimize the thermal resistance layer between the chip and heatsink. Using the unique SEMIKRON packaging technologies, the output current capability and, consequently, power density is increased by more than 30% while using the same physical chipset and power module size. At approx. 50%, the Thermal Interface Material (TIM or thermal grease) accounts for the biggest proportion of the thermal resistance from chip to heatsink (Rth(j-s)), which is why it makes sense to focus on improving that layer first. The main task of the TIM is the thermal interconnection of two surfaces by smoothing out the module base and the heatsink roughness with a minimum layer thickness. Why does one paste perform better than another and why is it superior to a thermal pad? The answer is in the composition of the TIM, with the two main components the thermally conductive filling material (particles), and the matrix carrier material being responsible for the wettability. For the thermal resistance of the bulk part of the thermal interface material layer (Rth,bulk), the filling degree is the most important factor, while the thermal conductivity of the individual particles has less impact. The filling degree describes the volume of conductive material inside a compound. However, the thermal resistance of the contact layers close to the metal surfaces (Rth,contact) is mainly defined by the particle size and the size distribution of these particles. Therefore, for an optimum overall thermal resistance Rth, TIM, the filling degree, particle size, particle size distribution and, of lesser importance, the thermal conductivity of the particles has to be optimized. SEMIKRON’s High Performance Thermal Paste (HPTP) does precisely this. The correlation between filling degree and overall performance is also visible for the HPTP: The data sheet value for thermal conductivity is average, while the thermal performance when applied to the power module is superior, as verified in a comprehensive benchmark test performed by SEMIKRON. Beside these factors, the power module and its mounting conditions also have a significant influence on the HPTP performance. For this reason, the thickness and distribution of the thermal paste have to be optimized for every power module type. SEMIKRON HPTP is available on several baseplate-less power modules, each with an optimized printing pattern. Every pre-printed module undergoes comprehensive qualification tests to ensure the long-time stability and performance of the TIM in the application, as well as to guarantee shelf life before mounting. Along with industrial applications, more challenging requirements are also met, i.e. automotive standards. The second biggest portion of the overall Rth(j-s) is the ceramic material, and optimization makes sense here, too. Alternatives to Aluminium Oxide (Al2O3) Direct Bonded Copper (DBC) substrates used today are widely available. Considering thermal and mechanical parameters Silicon Nitride (Si3N4), AMB (Active Metal Brazen) ceramics are an ideal candidate, boasting four times the thermal conductivity and far higher figures for the main mechanical characteristics when compared to Al2O3. The benefits these components boast in terms of Rth(j-s) and output current capability are tremendous. Based on MiniSKiiP housing size 3 with six-pack topology, a typical motor drive application has been simulated. The replacement of the standard TIM with HPTP on the existing module on an Al2O3 substrate brings about a 34%reduction in the Rth(j-s)by. In a standard motor drive application operating 4kHz with an overload of 200% for 10s, the result is a remarkable 20% higher output current at the same junction operation temperatures. If the Al2O3 substrate is additionally replaced with Si3N4 using the High Performance Thermal Paste, the Rth(j-s) is reduced by as much as 54%, boosting the output power and therefore power density of the module by 34%. We can see that the combination of state of the art Thermal Interface Material and substrate technology within the power modules boosts the output performance of a motor drive’s application tremendously. And all of this without compromising the lifetime of the module.